Believe it or not, the Hairy Crab pictured costs more than a round trip from Shanghai to Hong Kong! For anyone interested in food in Shanghai then Hairy Crab Season is by far the most interesting part of the year. During the 9th and 10th months of the lunar calendar, autumn to you and I, Shanghai&apos;s culinary scene is all about hairy crab. They can be found in every market and restaurant at this time of year, they are even sold in vending machines at subway stations in nearby Nanjing. Make no mistake though, the finest specimens of this costly crustacean — large females — can set you back more than a prime steak. The thing is, unless you go to the effort and expense of finding the best hairy crab you will probably be left wondering what the furor is all about. 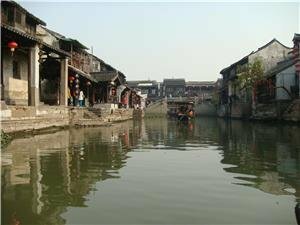 For that most Shanghai locals will tell you that you have to go to Yangcheng Lake. Really though, there are better ways to spend your holiday, and, anyway, pick the right restaurant and the Yangcheng crabs come to you instead. Ask a Shanghainese person about Hairy Crab and they will insist the best way to eat them is simply steamed - "extra ingredients corrupt the flavor", according to the Shanghainese person I asked — with a sauce of rice vinegar, sugar, and ginger to dip the crab in. Some restaurants in Shanghai could be accused of being miserly with regard to the amount of crab they actually give you in mixed dishes, so ordering simple steamed crab has the advantage of avoiding this trap. 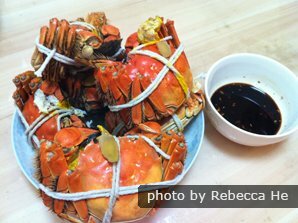 Steamed crab is the most simple, traditional, and ritualized way of eating hairy crab. There are eight different tools used to deconstruct the Crab, each designed for specific parts. It is a mark of skill, and in fact a show of status, to be able to eat crab without cracking the exoskeleton, so that you can reassemble the crab with its shell. However, for the uninitiated tourist it can turn into a rather protracted and messy affair, crab will go everywhere, so don&apos;t wear your best clothes, they will just get crab on them. Many restaurants are now offering to do the dirty work for you, and will bring you the meat ready shelled. As one expat blogger remarked "It&apos;s surprising how much better hairy crabs are after you&apos;ve removed the obstacle of actually eating it". Westerners might choose to pair their hairy crab with Champagne or white wine, but if you are going to try the local food you should make sure you do it right. The Chinese pair hairy crab, no matter the dish, with Shaoxing style Huangjiu. 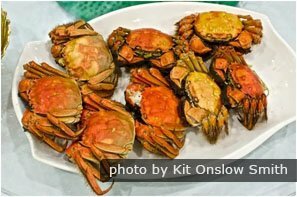 The &apos;yellow wine&apos; has been the traditional accompaniment to hairy crabs for centuries, not just for its ability to coax out the delicate flavors of the dish, but also for its traditional Chinese medicinal properties. Chinese medicine places great importance on balancing hot and cold energy - Yin and Yang. It is believed that a failure to keep these two forces in balance will block your qi, resulting in body aches and lethargy. Hairy crab is regarded as a yin, and the Huangjiu as yang, though experience will show you that too much of the latter will give you body aches and lethargy no matter how much crab you eat. Cheng Long Hang Crab Palace (成隆行蟹王府): As the name suggests, this place is all about crab. The array of private dining rooms creates an intimate atmosphere and means that any messy mishaps won&apos;t happen in front of an audience. It is a good idea to reserve a table, particularly during hairy crab season. 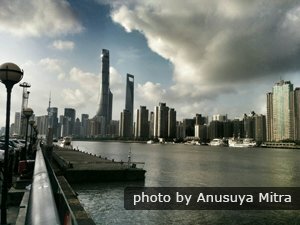 Yuan Yuan (圆苑酒家): A high end Shanghainese restaurant popular with locals and expats alike, even if you don&apos;t time you trip with the hairy crab season, this is still a place you should try. 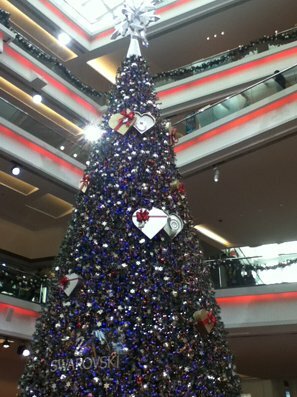 It is best to book a table to make sure you book to beat the crowds. Wang Bao He Restaurant (王宝和酒家): The old brand “Wang Bao He” was firstly established in the ninth year of Emperor Qianlong of the Qing Dynasty (i.e. 1744). It is famous for crab banquet and yellow wine. If your coming to Shanghai in fall (crab season), then we can arrange for you to eat hairy crab at one of the best restaurants, with a guide and private transport to satisfy all your needs for communication and convenience, as part of a Shanghai tour. You can also use this information as an evening free-time suggestion. 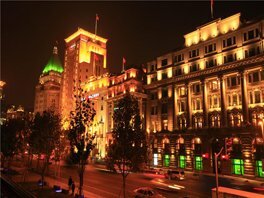 Many of our longer Shanghai tours include free time in the evening to explore Shanghai at your leisure.